We pride ourselves on delivering quality care. MF Care Management has ISO 9001 in place and employs a dedicated Quality Assurance Officer. We provide a personal care plan which is tailored to your individual needs. We monitor the service provided by our care workers on an ongoing basis, by one to one phone calls, face to face meetings, monitoring visits, audits and questionnaires to ensure you and your family are satisfied with the service being provided. We actively listen to your views and suggestions and implement any changes required to ensure your desired outcomes are achieved. All our care workers have a one-to-one performance review every three months, as well as an annual appraisal, where their own training needs and personal development plans are reviewed. Delivering a quality service starts with the right culture and values. We believe that everyone has the right to live in a way that makes them happy, and allows them as much independence as possible. We work hard to instil this culture throughout our organisation, and ensure our care services are delivered by skilled, honest, respectful and compassionate people. MF Care Management is registered with the Care Inspectorate as a combined service for Care at Home and Housing Support services. 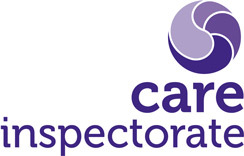 The Care Inspectorate are an external, regulatory Government body and all services have a legal obligation to register with them. We are subject to unannounced inspections and graded in accordance with Care Inspectorate grades. All our care workers receive regular training. This starts with an approved induction course covering issues like health and safety, customer care, diversity issues, and personal hygiene. With regular refresher courses, our care workers’ skills are kept up to date and everyone is aware of new developments within the industry. Those who want to develop their skills further are actively supported to take advanced social care qualifications. Scottish Vocational Qualifications in Health and Social Care Levels 2, 3 and 4. We also provide the Best Practice in Dementia Care course which is accredited by City and Guilds and facilitated by The Dementia Service Development Centre at Stirling University. MF Care Management has a robust recruitment process and staff are only employed with two satisfactory references and PVG. All new employees undertake a 3 ½ day induction programme and a shadowing period followed by a three month probationary period. MF Care Management’s competency framework is undertaken and will evidence the knowledge and skills on which to base their practice.